The Inter Services Selection Board (ISSB) is a committee for the selection of commissioned officers in the armed forces of Pakistan, Army, Navy and Air Force. On this page, you will find ISSB Preparation Material for good preparation of ISSB tests and interview. Selection in ISSB is made on the basis of 5 days of psychological screening to test the ability, aptitude, and personality of a candidate. During 5 days at ISSB, your personality is assessed from different psychological and physical angles. 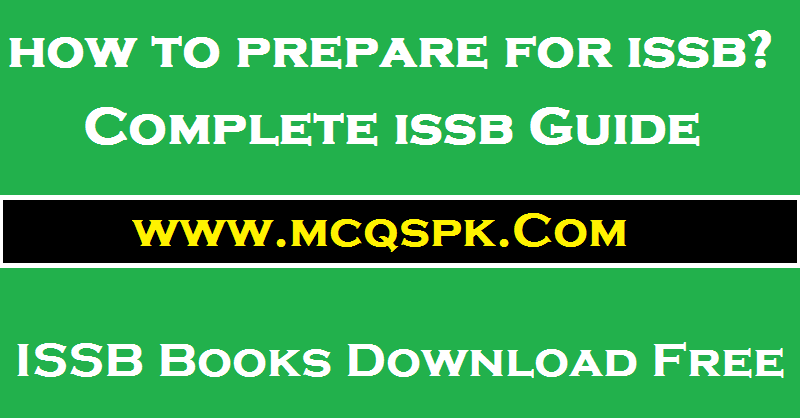 Here we will provide you ISSB complete guide, ISSB preparation material and ISSB free books which will help you prepare for ISSB tests. You can download these ISSB materials and ISSB books free of cost from our website. We have a separate section for each and every test held at ISSB. Just click on the respective link of your desired test so you can start preparing for that specific test of ISSB. There are multiple tests in ISSB so you have to do preparation for all tests one by one. If you are a new candidate and do not know anything about ISSB, then click on all links one by one and prepare all tests one by one.